Alexander grapples with money management in this beloved picture book from Judith Viorst, author of Alexander and the Terrible, Horrible, No Good, Very Bad Day. Last Sunday, Alexander’s grandparents gave him a dollar—and he was rich. There were so many things that he could do with all of that money! This is a more introductory book, for kids starting around age four. Judith teaches kids about input and output… income and expenses. It’s a great lesson about how money is finite, and you can read this one before your kids even start attending school. No kid automatically understands the concept of spending money, even though it seems obvious to us as adults. A 4-year-old child doesn’t know the difference between having $10 and $100, until you start explaining what each amount can buy. Since it’s always better to learn from others’ mistakes than your own, let your kids learn from Alexander’s spending habits. 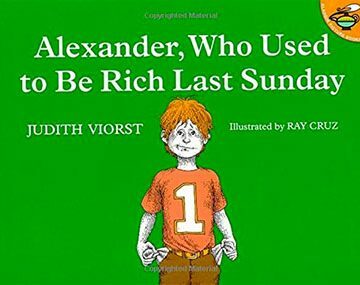 Alexander, Who Used to Be Rich Last Sunday was originally published in the 1970s, and it’s been a great money teacher for children ever since. I think it’s so popular because it’s easy to see the value that it teaches.